Following the B-377PG Pregnant Guppy was the larger B-377SG Super Guppy of 1965. This featured an outsize fuselage with a cargo compartment measuring 33.17m in length, 7.62m in width, and 7.77m in height, and an increased wing span and four 5220kW turboprop engines. 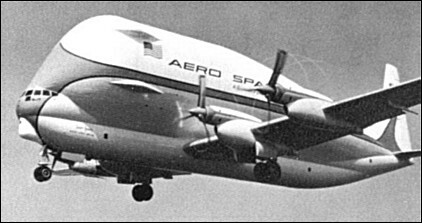 The only aircraft able to carry the third stage of a Saturn V launch vehicle, and the Lunar Module adapter, this Super Guppy was also used in the American space programme.